NAVIGATOR is a dedicated Web portal for readers of my books Truth, Errors and Lies. 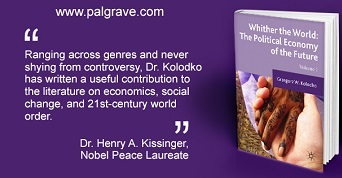 Politics and Economics in a Volatile World (link) and Whither the World: The Political Economy of the Future (vol. 1 & vol. 2). It contains a wealth of data – over 120 tables (T), charts (C) and maps (M) – illustrating the phenomena and processes discussed in the book. Importantly, this information is periodically updated to give readers quick and easy access to the most recent, reliable data. It is supplemented with numerous links to external sources. NAVIGATOR is a priceless tool for those who like to analyze numbers and indicators, study graphs and trend lines, watch the world through maps and full-color photographs. The latter, taken by the author himself, show various places and situations he writes about. There are over 180 photographs, captioned with short quotations from the book (along with page references). NAVIGATOR adds lasting value to the indispensable factual and statistical information provided in Truth, Errors and Lies. Politics and Economics in a Volatile World and Whither the World: The Political Economy of the Future. Readers who will re-open the book many years from now will see that the facts and interpretations it offers have stood the test of time, but their statistical background needs refreshing. Thanks to the portal, the users will stay abreast of the developments. NAVIGATOR also contains a large bibliography, comprising almost 500 items. Interested users will find there guidance on further reading concerning man and society, civilization and economy, the world and development, the past and the future. Several dozen items are in the form of Internet hyperlinks, which means that many interesting sources are just a click away. This will greatly facilitate research for scholars and students alike. Finally NAVIGATOR includes a blog where the fascinating, never-ending debate goes on about the world’s society, global economy and human fate. It inspires one to reflect also on one’s own place in the volatile world and one’s own prospects. In this way the user can exchange ideas with the author and other interested readers. NAVIGATOR is a unique aid allowing the user to enjoy to the fullest the extraordinary trip through time and space offered by the books. With NAVIGATOR in hand (or, more precisely, under the mouse button), you will never lose your way in the modern world.